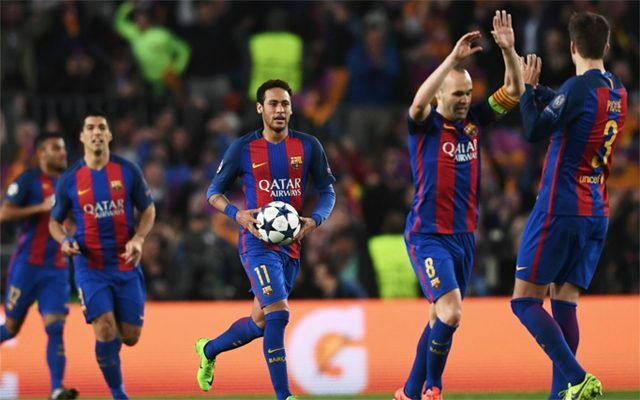 Barcelona defeated PSG 6-1 to complete one of the most dramatic comebacks the Champions League has ever seen. Barcelona came into tonight’s game with little hope of making it through to the knockout stages. The Catalan giants were defeated 4-0 in the first-leg at the Parc des Princes, and needed to get off to a good start tonight if they were to have any hope of progressing. Step forward Luis Suarez. The Uruguayan gave his side the lead within the first five minutes. Suarez’s header was adjudged to have crossed the line by the fifth official, and Barcelona had got the early lead they direly needed. Before long, Luis Enriques’s side had a second. Andres Iniesta’s classy back-heel was turned into his own net by Layvin Kurzawa, who put real pressure on PSG by cutting their deficit to two. Lionel Messi then found the back of the net from the penalty spot to put Barcelona within touching distance of completing a stunning comeback. However, Edinson Cavani was not going to stand by and see his side be eliminated from the competition. The PSG star fired into the roof of the Barcelona net to all-but end any hopes of a comeback. It was his 38th goal of the season in all competitions, coming in his 39th game. Neymar found the back of the net twice late-on. First, a stunning free-kick, and then from the penalty spot. It set up a nervy final few minutes, and Barcelona then completed one of the most incredible comebacks in Champions League history. Sergio Roberto found the back of the net to ensure it was Barcelona who progressed. What an incredible game.